Three days ago, filmmaking duo Zhang & Knight, released their new video for stand out Irish artist Eden’s track Float. This is their third installment with the young musician, and their work has grown from strength to strength across the trilogy. Earlier this week Scottish group Young Fathers announced that their new album Cocoa Sugar would be releasing on March 9th. Coupled with this news, they released a single off the new album entitled 'In My View'. We quickly fell in love with the track and have had it on repeat for the last two days straight. With the 25th anniversary of the Collection fast approaching, Ralph Lauren are set to drop one of their most iconic releases, the 'Snow Beach' Collection. This re-release of the Snow Beach Collection will include such items as the multicoloured Snow Beach bucket hat with other iconic additions such as the Snow Beach pullover and vest. We recently stumbled upon a brand new independent lifestyle brand called 'Own' Fan Club. Based in London, the brand plays on a satirical view of football and the culture surrounding it. The brand has been inspired by the post-punk scene of the 1980s, with other influences being football fanzines and the second summer of love. Last week, Copenhagen based company Le Fix released a video feature for their Spring / Summer 2018 campaign. The collection, is all about the search for what actually makes the guys over at Le Fix happy in their daily life. Entitled 'Happy Nothing', the guys over at Let Fix aimed to pause the hectic , and sometimes overwhelming, city life of fixed routines in order to reflect on how to find happiness. Earlier this week, Adidas Originals and United Arrows & Sons released a brand new capsule for Spring/Summer 2018, consisting of both apparel and footwear styles.Within the capsule, Adidas and United Arrows have collaborated on a number of pieces including, among other pieces, a track top, jackets, jerseys and a zip-up sweatshirt. Featured on Nowness only two weeks ago, talented filmmaker Wael Alaa’s new film gives us a brief insight into the world of ‘Mahraganat’, a street music style that has emerged from the ghettos of Cairo. We first came across the work of London- based filmmaker Dan Emmerson's work after watching his film 'Gannin Hyem' back in August. If you haven't seen it already, go check it out and then come back to us.From that point on we quickly became massive fans of Emmerson's distinct style of filming aswell as the themes within his films. Dan's new film focuses on a group of Generation X ravers attending an old school dance and trance festival which takes place in Blackpool. December 31st saw the release of The Warehouse Project's sixth episode of WHP radio - a series produced in association with Crack Magazine. The podcast series consists of conversations with Warehouse Project residents and big names from the music scene. Previous episodes include artists such as Paul Woolford, Graeme Park and Moxie. In their most recent instalment, The Warehouse Project sat down with Derry Native Or:la, who has been a resident during 2017 at Store Street. In an industry of extreme competition and saturation, Molly Manning Walker is emerging as one of the most talented young filmmakers in London. We were lucky enough to catch up with Molly and ask her about her work, her influences, and her thoughts on gender equality in the film industry. Having released a number of jerseys last month, Milan- Based company 'Les Vêtements de Football' by NSS Mag return with yet another striking set of football jerseys, that incorporate some of the biggest names in the fashion industry such as Gucci, Balencigga & Comme Des Garçons. Palace have just shared their new skate film Palasonic via Youtube and Vimeo. The release follows the films premier at London brand's MWADLANDS skate park back in October. The film - which runs at just under 40 - minutes in length, features some familiar Palace faces such as Lucien Clarke, Shawn Powers, Benny Fairfax, Rory Milanes plus much much more. In the Florida Everglades rabbit hunting is a rite of passage for young men, practiced since the early 1900s. Directed by the incredibly talented Patrick Bresnan, The Rabbit Hunt follows a family as they hunt in the fields of an industrial sugar farm for rabbits. The Rabbit Hunt was a selection at the Berlin International Film Festival and the 2017 Sundance Film Festival. The idea for ‘Take Me Home’ came about a few months ago when we realised the lack of awareness for dogs in rescue shelters. There seems to be a stigma attached to these dogs, particularly those of a restricted breed, which sometimes causes people to choose to buy their pet from a breeder despite the large number of healthy dogs living in shelters, unable to find homes. Over the last few months we have visited some shelters around Ireland in an attempt to capture the story of these animals. Over the last ten or so years, Irish director Aoife McArdle has become a tour de force in the world of moving pictures. Now she's making her feature film debut, and the trailer is chillingly good. The Balti Club first came across the work of Amy Warwick a number of months ago via her Instagram page. Ever since, the 22 year old from Essex has been on our radar and we are thrilled to bring our readers this interview into the life of an extremely talented photographer who is constantly pushing youth culture. We came across the work of photographer Lewis Khan a few months ago, and have been closely following him ever since. In one of his most recent series' 'Love Time', Lewis captured some incredibly moving imagery while in residency in the Chelsea & Westminster Hospital. Late last month, NIKE SB released a new video to coincide with the Barcelona Street League. The video celebrates the skate culture within Barcelona, which has been a renowned hub for European skateboarding throughout the ages. Directed by the extremely talented Sergi Castella, the video includes all of the main skating attractions within Barcelona such as La Guineueta, MACBA and Sants. Adidas Soccer and KITH have teamed up just in time for Summer 2017 to bring you an exciting new football capsule. The capsule incorporates two of KITH's clubs - Flamingos and the Cobras.The capsule includes a number of great pieces for both on and off the pitch. The guys over at Milican have just released the second instalment from their 'Meaningful Journeys' video series. The series aims to explore creative mavericks and independent spirits who travel their own path through life. For episode two, 'Meaningful Journeys' follows travel photographer and Milican ambassador James Bowden. In case you didn’t know, the talented Hugh Mulhern has a film that’s screening this week at the Fastnet Film Festival in Schull, Cork. We talked to Hugh a while ago about a few things, among them was this short film, The Cyclops. Pickles magazine has just released its thirteenth issue which features 10 articles, more than 20 original artworks, two photo essays and much much more. The independent football magazine was established back in 2011, and since then has been documenting the culture surrounding football in an extremely unique way. Frank Ocean and A$AP Rocky Debut "RAF" on Blonded 006. Yesterday, out of the blue as per usual, Frank Ocean dropped a new episode of his infamous blonded RADIO on Beats 1. The episode feature an eclectic mix of music, along with a new track from the man himself and A$AP Rocky. A few months ago we had the pleasure of interviewing Irish filmmaker Hugh Mulhern. Hugh has worked with many talented artists in the past, making videos for the likes of Hare Squead, AJ Tracey and Dah Jevu. However his most recent video is a step in a new direction. In the last few years Lev Tanju's PALACE Skateboards has gone from being a small brand under which he made skate videos and the occasional t-shirt, to one of the most recognisable brands in streetwear. With the release of a recent video, it looks like PALACE is about to hit NYC. This series chronicles a four day trip spent with a (partially) full crew of Balti’s travelling up and down the River Shannon. Below par nautical skills, plenty of Guinness , Buckfast and catching up. From Offaly to Athlone, we travelled upstream, against the flows of time, laughing, reminiscing, carefree Boys Of The River. It seems like a recurring trend these days that the artists you want to listen to the most are the ones that release the least. Such is the story of enigmatic London born artist Archy Marshall, a.k.a King Krule. However, last week the London artist treated us to two new tunes. The Balti Club have been keen followers of The Lurkers ever since we stumbled upon their Copenhagen video back in 2014. The London based brand formed back in 2012, with an aim to provide a platform for content of places and faces within our world that have been neglected or forgotten. Over the last few years the guys have had numerous adventures, consistently putting in the Lurk so you don’t have to. As part of our ongoing photographer series, we are very lucky to feature the work of Rosie Matheson this week. 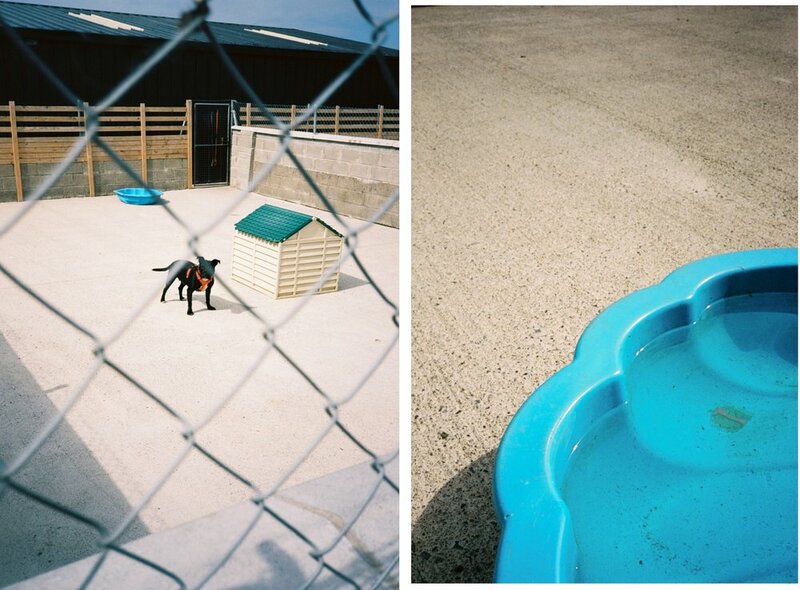 Rosie is a 21 year old photographer from Brighton, currently based in London. You might have seen her work before in publications such as FT Magazine, or perhaps come across some of her striking portraits on Instagram, the subjects of which range from British and Irish rappers Big Narstie and Reijie Snow to British boxer Harlem Eubank. Video: African Surf brand Mami Wata release "Wowza"
Early this week saw the release of a beautifully shot short film from African surf company Mami Wata. Based in Cape Town, the brands name is a West African term which in English translates to 'Mama Water' or 'Mother Ocean'. The brand is derived from the owners love for Africa and their deep rooted passion for surfing. Nike continues to celebrate their two-decade anniversary for the Air Max 97' with a limited release of the iconic 97 OG 'Metallic Silver', or 'Silver Bullet' as its more commonly referred, being made available to purchase via their online store. The late-1990s shoe has stood the test of time and remains a true classic, and one which can be found within most sneaker enthusiasts collections.